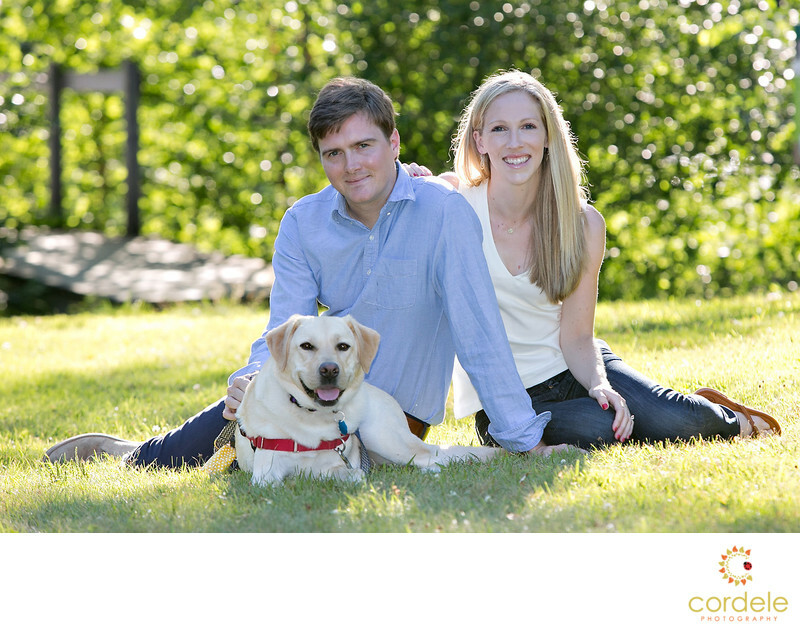 I love Dogs and dogs and engagement sessions outside Boston are fun! Its no secret. I love people that love dogs! This dog, Rowdy, was the absolute best dog ever! The couple wanted to bring the dog to the engagement session and I have to be honest, I was nervous. Dogs can be like kids, totally unpredictable and never looking towards me. This dog, rocked my world. She listened, she sat when we needed her to sit, and she totally was on her best behavior. Whenever I needed to have her look at me, I'd say "Do you want...?" and she would look right at me. It was a great little trick. Bridget and Michael were getting married in just few short days later at the Lyman Estate. Their wedding was so simple but elegant. During their engagement session they had some great light cutting through the trees at the Old North Bridge in Concord. It's one of my favorite spots and I love when I get a nice day down there. The sun was in the perfect spot for this photo and I love the glow of her hair and the color of his shirt against the backdrop. Location: Minuteman Park, Concord, MA.